On March 20, 2019, the Precinct Commitee Persons (PCPs) held their endorsement meeting for the May 2019 Elections. We had the opportunity to hear from many wonderful candidates and there were some tough choices for the PCPs to make. 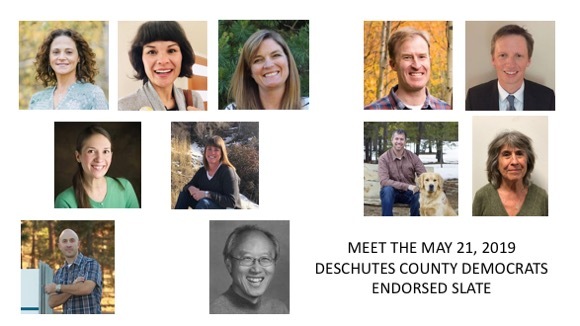 In the end, we endorsed the candidates that you see above as well as both the Bond and Levy Measures (Measure 9-126 and Measure 9-127) in Redmond. We have invited our slate to come and talk to you about their upcoming campaigns. It is hard to believe that there are only 40 days until Election Day and that ballots will go into the mail in 22 days. As you have heard me say, May Elections are not a marathon. They are a sprint. So far, our candidates have put a lot of work in getting websites up and running, putting together statements for the voters' pamphlet, and working on finalizing their lit. For these elections, we have utilized our new Campaign Committee, our new officers, our former officers, and dozens of other volunteers to help these campaigns. Many volunteer hours have gone into these campaigns but it is still extremely vital that we also raise money in order to win in May. As we have increased our efforts in these campaigns, we also need your financial support. We have set up a new Act Blue page for these May Elections. Our goal is $5000. We do a lot with a little but running effective campaigns require your financial support. Please consider making a donation today. I would love to tell our candidates at the meeting next week that we have reached our goal. With your help, we can! Simply click on the giant green CONTRIBUTE button below. Did you know that the state of Oregon will pay you back for your $50 or $100 donation? That’s right - to encourage grassroots giving the state will fully refund your $50 (single) or $100 (married) donation on your 2018 state income tax return. Just note your donation on line 37 and take the full amount off the taxes you owe - it doesn’t matter if you take the standard deduction, this is a fully refundable credit and it means that you can give us $50 or $100 dollars at no cost to you! So take advantage of this opportunity and help elect Democrats with your grassroots donation! We will soon have our booths at Earth Day, Pride Day, and the Fourth of July. If you are interested in helping out, you can reply to this message. These events are always a lot of fun. Looking forward to those nice Spring and Summer Days. If you are interested in writing letters to the editor on behalf of our great slate, reply to this message and let us know. Our candidates have some great stories to share and would love your help. We have created a page on our website with all of the candidates in the May Election. We have links to websites, Facebook pages, and Twitter handles. We will continue to update as candidates provide their online information. You can get there by clicking here. Be sure to check out our Facebook and Twitter pages to keep updated on events in our community. Our great candiates are posting events on Facebook and really need your help to win in May. We will continue to share profiles and links to their pages. Just click on the buttons below.